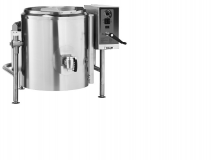 Gas self-contained, stainless steel, 2⁄3 jacketed floor mounted tilting steam kettle. ■■ Ellipsoidal bottom kettle liner formed and fully welded standard type 316 and type 304 stainless steel exterior. ■■ Bar rim (1⁄4 x 5⁄8 inch 20 gallons) (3⁄8 x 1 inch 40 gallons and greater). ■■ 50 psi (3.4 kg/cm2) steam jacket rating. ■■ Stainless steel enclosure for "water resistant" controls, self-locking tilt mechanism and faucet bracket. ■■ Controls include a power switch, power "on" light, solid state temperature control, vacuum/pressure gauge, pressure relief valve, low water light and lower water shut- off. ■■ Elevation from sea level to 8,999 feet standard. ■■ Kettle tilts forward 95 degrees to completely empty. ■■ Tubular stainless steel legs with flanged feet. ■■ One year limited parts and labor warranty.